This portrait of a Chocolate Lab is by Baba. The dog’s name is Grace and she is the mascot for a fabulous store in Brentwood called Grace’s Home Furnishings. 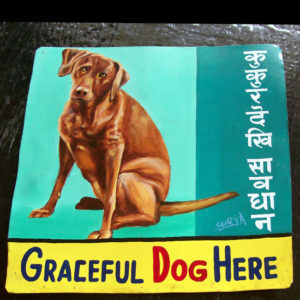 Grace is featured in all of the store’s advertising. The colors on this one are amazing. This portrait of Millie Vartan is by Baba. 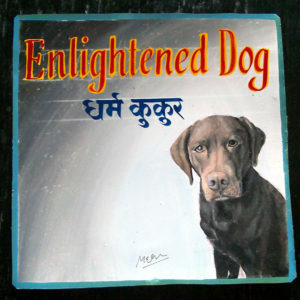 Another spectacular portrait of the Chocolate Lab Millie by Megh Raj Thapa. If you live in NYC, you can see this one in person at Prudence Designs (212-691-1356). 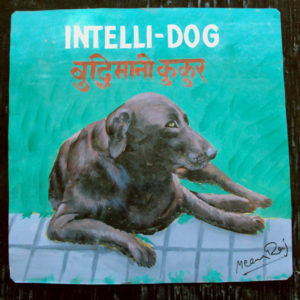 This portrait of Corky the (obviously) intelligent chocolate Labrador Retriever is by Megh Raj Thapa. 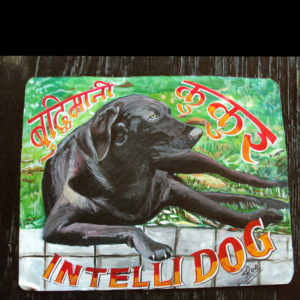 This Chocolate Lab Painting is currently available at Nomad in Boston. Please contact them at (617) 497-6677, and they will be happy to assist you with your purchases. Their website is NomadCambridge.com. Corky must be a smart dog indeed. 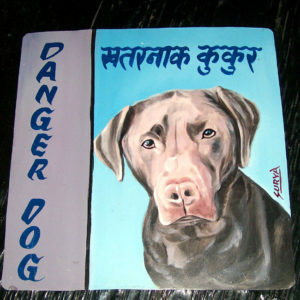 Sanjib Rana uses acrylic paint for his portraits. This is not to be used outside. All other artists in the project can be hung outside or in. This is an especially heavy piece of art. A portrait of Mocha, a very lucky Chocolate Lab indeed. This features ShaShi’s full signature on the lower left. 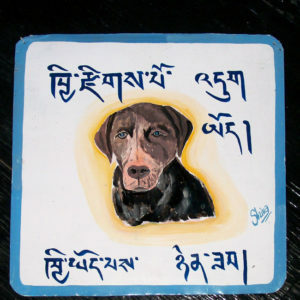 The Tibetan script in this hand painted beware of Chocolate Labrador sign will always get a laugh from a Tibetan. 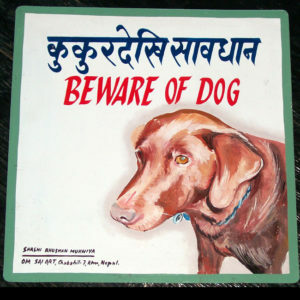 The sign roughly translates to: Brilliant dog here, is here. Do you have dog? Have none. 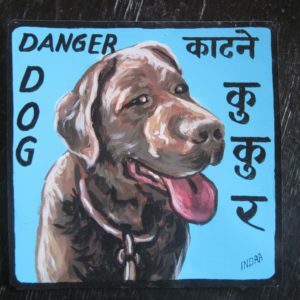 This painting of Millie Vartan the Chocolate Labrador by Shiva Thapa is a little larger than the norm at approximately 15’x15′. Hand painted portrait of Roubaix the Chocolate Lab. This pretty dog is vibrant against a bright blue background.